Buster crosses home plate after his homer. I am currently waylaid in the Phoenix Sky Harbor International Airport, my flight delayed by at least two hours due to stormy weather in San Francisco. As I blog (and sigh, and fidget) I stare at an illuminated sign in my boarding area that reads “Temporary AREA OF REFUGE”. I have no idea what this means – refuge from what, I wonder? Unfortunately I don’t see any cots or hammocks for napping, so there appears to be no refuge here from exhaustion. My Spring Training adventure has come to a close, and I’m a little sad to be saying goodbye to Scottsdale. Today’s weather was – no shock here — amazing, and my seats were much improved. Just like yesterday, I sat next to some really funny, friendly people. I think Scottsdale puts something in their water that brings out the nice, neighborly side of baseball fans. If so, where can I buy the stuff? I’d like to run it through the water filter at my office. Today was the high note of the trip, baseball wise. First and foremost: Buster Posey had his first hit of Spring Training off Indians lefty Tony Sipp, and it was (naturally) a home run. It’s rare to see unilateral support for a player at a professional sporting event – even in the preseason. But people all around me – Giants and Indians fans alike – were exuberant. Spring training facilities have an interesting feel — somewhere between a little league field and a big league ballpark on the intimacy scale. They aren’t rowdy but they aren’t sleepy little places either. 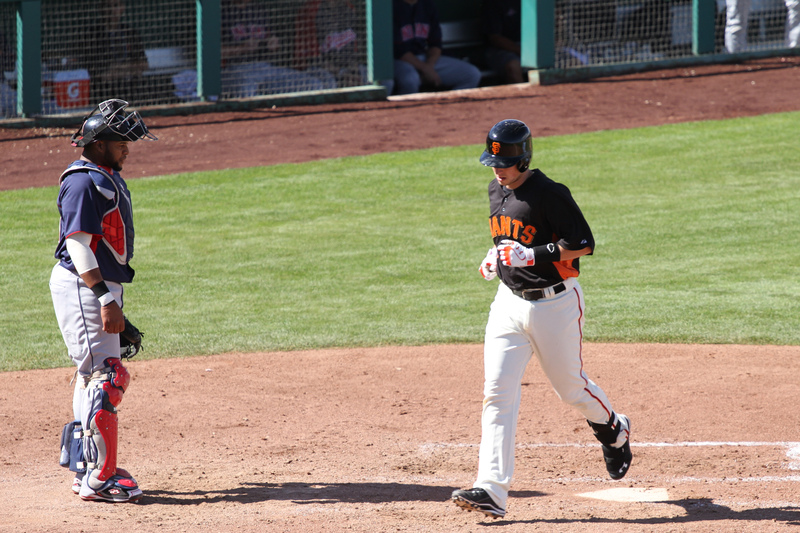 Yet, anytime Buster Posey approached the plate a hush fell over Scottsdale Stadium. At the risk of sounding melodramatic, people didn’t just stop talking… they seemed to hold their breaths too. When he hit that home run, 10,500 fans collectively exhaled… then went crazy. Matt Cain pitched well, allowing two runs on five hits in 5 2/3 innings. He was followed by Brian Wilson, who pitched with plenty of zip, and was hitless and scoreless. I got to see lots of familiar faces play for the Indians, Shin-Soo Choo (who famously got his hand broken by an errant Jonathan Sanchez pitch last season), Lonnie Chisenhall, Asdrubal Cabrera (who I strongly suggest fire his barber), pitcher Scott Barnes (a former Giant) and first baseman Matt LaPorta. I have a soft spot for LaPorta; he joined the Indians amid a lot of hype. When he didn’t quite live up to expectations, he was viciously mocked and vilified on Twitter until he finally deactivated his account. How fitting for me – the girl who has a troubling conflict of interest when the Giants play the Tribe – that the game ended in a 2-2 tie after 10 innings. Nobody won… but nobody lost either. Awesome! My flight is boarding. Adios Giants, see you in April! Good to see Posey back on track. My girlfriend and I traveled to San Fran for the first time ever this past winter, and let me say that AT&T is the first ballpark that stands toe to toe with Camden Yards. Very jealous that you have the team to go with the cathedral. It is a beautiful ballpark, and it’s very accessible if you live and work in SF.